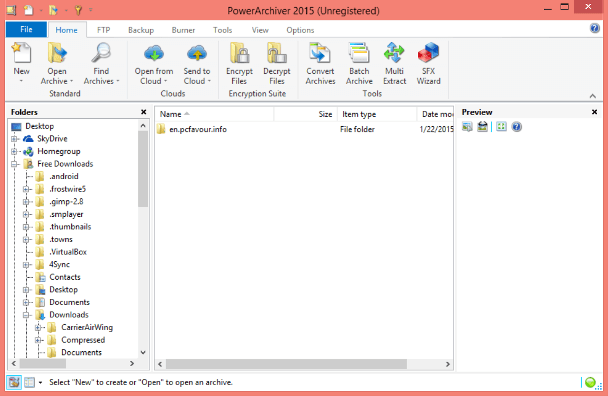 Free download PowerArchiver latest version. PowerArchiver is a proprietary file archiver for Microsoft Windows, developed by ConeXware Inc. It supports full read-write access to various different archive formats, including 7z, Tar and ZIP. Additionally, read-only (decompression) support includes RAR, ACE and several disk image formats. The evaluation version of the PowerArchiver remains functional for 40 days. Personal licenses are currently permitted free lifetime updates to all future versions of the software, while the business license is valid through two major versions. PowerArchiver’s first public release was made in March, 1999. It was advertised as a free archiving solution and was written in Borland Delphi. It turned into shareware in June 2001 with version 7. Prior to being PowerArchiver, the software was known as EasyZip. A command line version and a Microsoft Outlook plugin is also provided. PowerArchiver’s user interface has been translated into 15 languages. The latest release of PowerArchiver fully supports Windows 7 and provides the user an option to use the Ribbon GUI, as featured in Microsoft Office 2007 and Windows 7. Users can revert to the old-style toolbar if they wish.